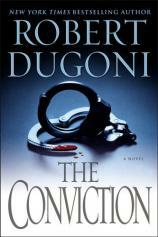 THE CONVICTION, Robert Dugoni’s latest book featuring attorney David Sloane, is not a courtroom thriller --- at least as that term is commonly used. Sloane is known as “the lawyer who does not lose,” but this time he comes close to losing everything, and not in the courtroom. "THE CONVICTION is a frightening story, made more so by the fact that all of us know of incidents that are similar to those described in this hair-raising novel.... This is one book that parents and their adolescent children need to read together." Jake, Sloane’s troubled and out-of-control stepson, acts out following the brutal and senseless murder of his mother. Sloane had surrendered custody of Jake to his biological father, but it’s clear that the man does not have the time or ability to manage Jake’s behavior. So when Detective Tom Molia invites Sloane and Jake to join him and his son, T.J., on a camping trip in rural California, Sloane accepts. He does so with the expectation that it will provide him with an opportunity to break through the emotional wall that Jake has constructed around himself. The trip has barely begun, though, before Jake has created serious trouble, not only for himself but also for the younger T.J., who becomes involuntarily involved. Following a boneheaded encounter with a storekeeper, Jake returns after hours to vandalize the shop and help himself to liquor and a rifle. T.J., who has followed him from a distance, is enticed into drinking and some nocturnal target practice, both of which result in their arrests. Their fathers are barely aware of their absence before both boys are brought before the local judge, whose family has ruled the bench for generations, and sentenced to several months at Fresh Start, a deceptively named juvenile detention camp. Sloane and Molia are understandably horrified, yet there appears to be little they can effectively do about it --- at least legally and in the short term. So the two fathers take the only course of action left open to them: they begin an extralegal and highly dangerous escape plan to free their sons, even at the cost of their own lives. Meanwhile, Jake and T.J. are in an environment far removed from their heretofore comfortable lives. Fresh Start is a lot of things, but it is not about rehabilitation. The concept of time being of the essence takes on an entirely different meaning once the book reaches its conclusion. THE CONVICTION is a frightening story, made more so by the fact that all of us know of incidents that are similar to those described in this hair-raising novel. My cousin was arrested while on vacation for trespassing in a hotel pool during spring break. The son of a friend of mine, while on a trip with his parents, did something similar to what Jake pulled and spent six months in jail hundreds of miles from home before he was even brought to trial. You may well know of similar stories. In that light, THE CONVICTION is also a cautionary tale of how ill-advised actions can have consequences far beyond what otherwise might reasonably be expected. This is one book that parents and their adolescent children need to read together.